A few weeks ago I traveled to Ethiopia to pick up our adopted son Isaac. Isaac was abandoned as a newborn infant and spent the first year and a half of his life in an orphanage. Thankfully, the orphanage was staffed with loving Christian women that showered him with hugs and kisses. The flip side, however, is that there were–surprisingly–more workers than children, so Isaac had people at his beck and call 24/7, and since the goal of an orphanage in Ethiopia is to nourish the babies until their adoptive parents come for them, discipline was hardly emphasized. Whenever Isaac wanted something, all he had to do was to scream, hit, and throw his toys and he got exactly what he wanted–not easy habits to break. 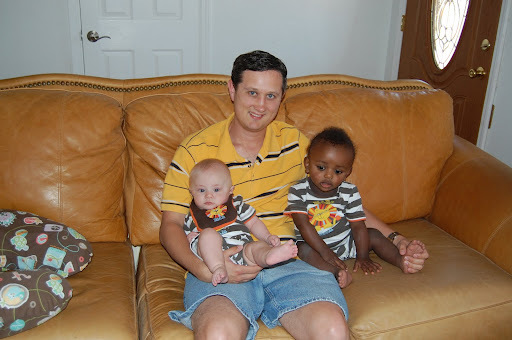 So what’s my new life like as an inter-racial parent? Well, for starters, my days of staying up until midnight and sleeping in are history. It’s one thing to father an infant. It’s quite another thing to father an infant and a toddler at the same time. The two boys are a year apart which makes it difficult for my wife who is still breastfeeding Christian, our six-month old son. Since Isaac spent the first year and a half of his life with other people and is now suddenly thrust into a completely different setting, he has some separation anxiety. For the first two weeks, he wanted to be held every second of the day, and when I put him down, he would scream to the top of his lungs. I used to make fun of dads that seem to have no problem reducing themselves to the role of Pee-Wee Herman in order to entertain their toddlers. Now after spending 21 hours on an airplane with my own toddler, it’s official. I get it. Adjusting to an international/inter-racial adoption is difficult, but one of the things that I haven’t had to deal with–at least not yet–is dirty looks and insensitive remarks. Everywhere my wife and I go, people are warm and friendly with us and our son. Black people, white people, Hispanics and Native Americans; the reactions are all the same. Some–especially white people– will go out of their way to show their approval. I’m under no illusion that things will stay this way. Nor do I think that our family is immune to the challenges that inter-racial families in the U.S. inevitably face. Following good advice, I’ve taken the time to study black history and black culture, familiarizing myself with the struggles that African American males face in the U.S. I know that individual and institutional racism remain an open wound to many black Americans. Still, I think it’s comforting to know that most people–in our experience– at least are trying to transcend their prejudices. That to me is progress. Last night I googled the words “drone attacks Obama” to verify if President Obama has indeed increased unmanned aerial drone attacks in the Afghanistan/Pakistan border region. Sure enough, not only has the president significantly increased these extrajudicial killings that also happen to kill a lot of civilians; it turns out that the ACLU has recently filed a lawsuit against the president challenging his right to carry out the attacks. Just for kicks, I’d like to take a look at President Bush’s human rights policies and see which ones have been continued under President Obama. Militarization of Latin America? Check. Fumigating crops in Columbia to fight the drug war? Check. Threat of military force against Iran? Check. Drone attacks against civilians in Pakistan? Increased. Military aid to Israel? Increased. What is striking about the President is that despite his smooth-talking in Cairo, despite the Nobel Peace prize, despite the never ending efforts of neo-con pundits to turn Obama into a first class whimp, the difference between Obama and Bush is a mile wide when it comes to rhetoric but an inch deep when it comes to reality. Granted, Obama’s willingness to work with—as opposed to arrogantly dismiss—the international community on issues like nuclear non-proliferation and global climate change, along with his more respectful tone towards the Muslim world, has gone a long way to reduce the knee-jerk anti-Americanism that was so prevalent during the Bush years. Still, I wonder if Christians in the historic peace-churches will be able to honestly vote for a second term in 2012 and still have the right to call themselves pacifists? While it may be true that a McCain/Palin administration would have been more bellicose and hostile to the rest of the world, at what point does voting for the lesser of two evils become complicity in acts of violence against others? Perhaps it’s a little early to ask this question, but the question still bothers me nonetheless. Interview with Bob Kellemen, author of "God’s Healing for Life’s Losses"
1. What’s the “big idea” behind God’s Healing for Life’s Losses? What would you like readers to take away from it? In a biblical sentence: you can grieve with hope (1 Thessalonians 4:13). God’s Healing for Life’s Losses gives readers permission to grieve and offers a pathway toward hope. I want people to see their suffering from God’s perspective without denying the reality that suffering still hurts. What would I like readers to take away? The title and subtitle say it best. I’d like readers to walk away with God’s healing hope. 2. What motivated you to write God’s Healing for Life’s Losses? Why did you choose to write this book? My ministry to real people with real hurts motivated me to write God’s Healing for Life’s Losses. People quickly grow weary of Christian books that pretend. They’re tired of Christian counselors and well-meaning friends who dispense far too much “happiness all the time, wonderful peace of mind.” They’re also gravely disappointed when the answers to their questions about suffering reflect more of the wisdom of the world than of the truth of God’s Word. The purpose of the book, as the title and sub-title suggest, is to assist people on their grief and growth journey to find God’s healing hope in their hurts and losses. Life is filled with losses. God’s Word is filled with compassionate wisdom to help us to find God in the midst of life’s pain. That’s ultimately my purpose in writing the book: to help people to find God even when they can’t find relief. God’s Healing for Life’s Losses offers no pabulum, trite platitudes, false promises, pretending, or “easy steps.” It is real and raw as it enters into the abyss of suffering and empathizes with the gravity of grinding affliction. And, like the Apostle Paul, it deals simultaneously with grieving and hoping (1 Thessalonians 4:13). 3. With all that’s going on in the world, why this book now? What’s unique about God’s Healing for Life’s Losses? Some grief books, even some authored by Christians, follow the world’s model of grieving—the typical denial, anger, bargaining, depression, and acceptance stage approach. They rarely seem to move beyond a “secular” way of looking at grief. Other Christian authors seem to minimize the grief and hurt, and attempt to race people quickly to healing hope. So we end up either with secular help or shallow help. There has to be a better way. Christians long for an approach that faces suffering honestly and engages sufferers passionately—all in the context of presenting truth biblically and relevantly. We need to be able to face life’s losses in the context of God’s healing. Jesus did. “I have told you these things, so that in me you may have peace. In this world you will have trouble. But take heart! I have overcome the world” (John 16:33). God’s Healing for Life’s Losses deals honestly with the full range of human emotions—from a biblical perspective. We explore and journey together through four parts of the grief process: from denial to candor (honesty with self), from anger to complaint/lament (honesty with God), from bargaining/works to crying out to God, and from depression to comfort (finding God even when we can’t find relief). God’s Healing for Life’s Losses then journeys with people through four aspects of the growth process: waiting (when God says, “Not yet”), wailing (pregnant with hope), weaving (spiritual mathematics), and worshipping (finding God). 4. How can people learn more about God’s Healing for Life’s Losses? On my website at http://www.rpmministries.org people can find and download a free sample chapter of the book. Also at my website, people can order the book at 33% off. Additionally, I offer seminars around the country on God’s Healing for Life’s Losses. People can find my speaking schedule at the website. If a church or para-church group is interested in seeing if I could speak for their group, they can contact me at rpm.ministries@gmail.com. 5. God’s Healing for Life’s Losses is the first book ever officially endorsed by GriefShare. Tell us about your connection with this organization. GriefShare produces a small group video series used in thousands of churches across the world. It is a ministry of the larger group, Church Initiative, founded by Steve Grissom. Several years ago they updated their video series and asked me to participate. I connected with Steve and with their VP, Sam Hodges. When God’s Healing for Life’s Losses was in the first draft stage, Sam and Steve read it and got very excited. They both appreciated the combination of compassionate care that did not minimize the pain of suffering with the focus on Christ-centered, biblically-based hope. Sam graciously wrote a recommendation, Steve graciously penned an endorsement, and my publisher, BMH Books, and GriefShare agreed to have this book become the first book ever officially endorsed by GriefShare. It’s our joint prayer that the GriefShare video and God’s Healing for Life’s Losses could be used together to assist 1000s of churches and para-church groups as they minister to hurting people. 6. Who should read God’s Healing for Life’s Losses? Sometimes the second we hear words like loss and grief, our minds focus exclusively on death and dying. God’s Healing for Life’s Losses focuses on any type of loss—from the grand loss of death, to the daily casket experiences of the loss of a job, the loss of a dream, the loss of a relationship… So anyone struggling with any life loss would benefit from reading God’s Healing. God’s Healing for Life’s Losses also equips spiritual friends, pastors, and counselors. When we’re helping hurting people, it can get messy and confusing. A few “handles,” a few “road markers” on the journey sure would help. That’s what God’s Healing for Life’s Losses offers. It provides a “map” without becoming a straight-jacket. It suggests eight “directional markers” that become something of a GPS—God’s Positioning System—for the grief and growth journey. God’s Healing for Life’s Losses examines Scripture relationally and practically so that helpers grow in their ability to explore passages with hurting people—and do so in a natural, loving, caring, skillful way. Also, the two built-in discussion/application guides benefit small group leaders—providing an ideal forum and format for candid discussions about grief, emotions, hurt, hope, healing, God’s purposes, and much more. Now that I have two small children, I’m finding very little time to write, so I’ll make this brief. My wife and I have been back in New Mexico since last Wednesday. Before that we were in St. Louis for a couple of weeks so that my parents can have their special time with our newborn son Christian. After two weeks my dad and I went to Ethiopia to pick up Isaac, the new addition to our family. Isaac is fun, playful, and affectionate–but also a hand full!! Since we got him when he was a year and a half, there’s some real separation issues that he’s dealing with. It’s been a difficult adjustment for him and for us but I know that in his own time he’ll settle down and realize that we’re his forever family. As far as ministry is concerned, the planning for the festival in Farmington for August 28th is going well. The churches involved have started an initiative called “United to Help.” The premise is to unite the churches in the Four Corners region to help the community in practical ways while giving the Body of Christ a platform to share the gospel. The four pillars of “United to Help” are we give, we serve, we pray, we celebrate. United to Help is taking on a life of its own now and, frankly, I’m blown away that the Lord is using me as a catalyst to get this started. The first all-church service project is on June 24th. The participating churches will be helping a charity called the Family Crisis Center, a shelter for battered women, move into their new facility. What’s great about “United to Help” is that it’s not a one time thing. It’s a comprehensive vision that incorporates the elements of unity (like joint worship, joint prayer) with elements of service and evangelism (like joint food drives, joint service projects and an annual festival). The churches involved see United to Help as a long term vision that will take place year after year. If you live in the Four Corners region and you’d like to know more about United to Help, shoot me an e-mail. Okay, this is me thinking out loud, but I really think that “United to Help” can be a model for other towns and cities across the nation. Again, that could be just me getting ahead of God with my own agenda. Time will tell. I just received this by e-mail today. It’s an excellent example how the power of the gospel can disarm even the most violent militants. Last year Loren Cunningham, founder of YWAM, invited me (Avery Willis) to go to Port Harcort, Nigeria to do a Call2All type emphasis with him in October. I was not able to go. Yesterday I heard his report and it was truly amazing. As they prepared to go into the country the militants in that area were planning a big terrorist attack. These 3000 militants were former university students who started out protesting corruption in government but after they took over large oil fields they became corrupt. They were able to get all kinds of munitions with the money from the oil and were a danger to the government. Twenty-six Youth With A Mission Nigerians (18-24 years of age) in a prayer meeting for the militants heard God tell them to go serve the militants and share the gospel. The militants accepted them because they were willing to do anything–wash dishes, clean toilets, etc–to serve them. The youth said that they would work for 2 1/2 hours and then wanted to share with the militants who even listened to their proclamation of the Gospel. One day a militant who was possessed by a demon ran at the youth with a knife because he said he could only be free if he killed someone. Even the militants told the youth to run. Alex, a 20 year old who had been a believer only a year, stood his ground and advanced on the man. Even the possessed man told him to run because he had to kill someone. Alex said, “Not today. Because Jesus is going to set you free!” At the last moment the man threw down knife and the demon left him. Three hundred of the militants came to faith when the youth proclaimed the gospel. The youth took the bombs and munitions to the police over very bumpy roads without incident. A whole guerilla movement was dismantled and disarmed by the power of God. The government then asked YWAM (who has three bases in the whole country) to open three bases in each of the 36 states in Nigeria!